Nosara, one of the oldest expatriate communities in the country, as well as a fishing and agricultural area, is one of the most popular destinations in Costa Rica. Located where the turtles meet the monkeys, this area has enjoyed both the protection of the national park system, as well as the decades-old efforts of the local citizens association that keep the beaches pristine and ensure hundreds of acres of protected forest interspersed with small-scale development. The community of Nosara has always strived to harmonize development with nature conservation. 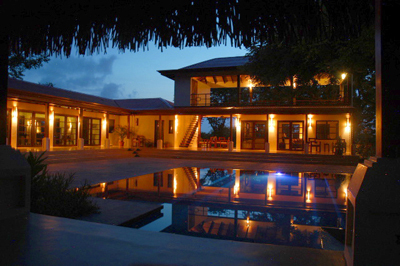 Costa Rica Yoga Spa is one of the best places to start your yoga journey or deepen your yoga practice. You can easily embark upon a yoga teacher training here. 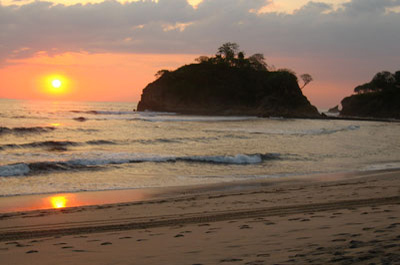 This the perfect place to enjoy the breathtaking beauty of Costa Rica’s Gold Coast of Guanacaste. Costa Rica Yoga Spa,located between the magical waters of the Rio Montaña and Rio Nosara and awe-inspiring Refugio National Silvestre Vida Ostional National Park, is a perfect destination in Costa Rica. The Harmony Hotel, an eco-hotel with exemplary credentials, is a hotel in tune with nature – it’s environmentally conscious, and set in tropical gardens, with howler monkeys, hummingbirds, iguanas all around. Situated in Nosara, this spa hotel is in the same area as Garza Beach, Ostional Wildlife Refuge, and Ostional National Wildlife Refuge. Harmony Hotel has a full-service spa, an outdoor pool, and a children’s pool. This spa hotel offers a restaurant and a bar/lounge. Using the ancient wisdom of Vastu Shastra, an ancient doctrine which consists of precepts born out of a traditional view on how the laws of nature affect human dwellings, to create a truly sacred space for your yoga or spiritual retreats; workshops and groups; teacher training; or simply your own private get-away, AHKI retreat offers you a very special location in support of your transformation, growth and overall wellness. This place is a “Sanctuary for the Soul”. Upon entering the property you will be greeted with the serene sounds of nature, and meditative music. Rosie’s is a no-frills tico diner. Rosi’s Soda Tica, run by a true tica cook, is a fun outdoor experience and they cook right there in the corner. Rosie prepares every meal right in front of you in an open kitchen right in downtown Guiones. Although the pace can get a bit hectic, it is only due to the quality, fair priced food. Lunch is also a great deal at Rosi’s with delicious comida tipica, typical national dishes, like Casados – fish, chicken or meat with gallo pinto (rice and beans) and a mixed salad for less than US$7.00. It’s a great spot to have lunch. The restaurant and bar is open air, looking out onto tropical gardens, and open from 7:30 am until 9:30 pm. 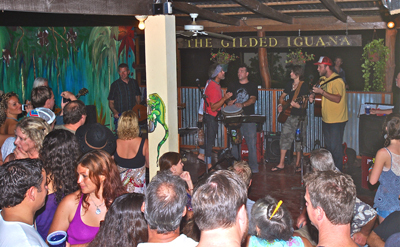 The Iguana is located down the dirt roads in the quaint town of Nosara. Their food is some of the best in town, and our fast and friendly service is renowned. 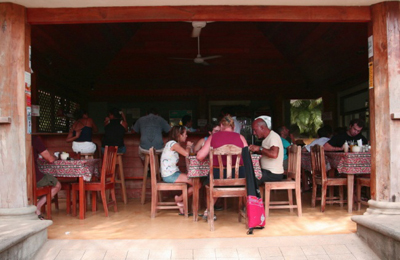 The main area of the Gilded Iguana is the dining area. 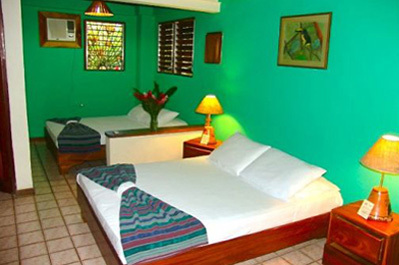 A beautifully decorated open, but covered, room is painted with iguanas and stylish décor. The Gilded Iguana Restaurant was recently voted the best Seafood and “overall Value” restaurant in Nosara by readerʼs of the Del Sol Magazine, a Samara, Carillo and Nosara area magazine. Situated just 100 Meters from the South Beach Entrance of Playa Guiones, this groovy cafe has tasty breakfasts and a lunch menu that includes quesadillas, a variety of sandwiches, and uber popular fish tacos. The have high speed wi-fi. Another interesting feature of this restaurant is that they offer free international calls to the US and Canada. 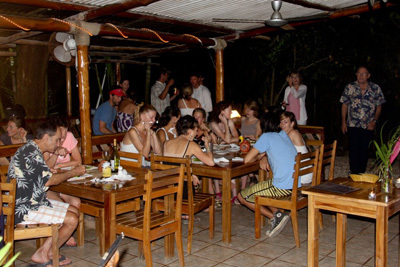 It’s a perfect place to step off the beach and walk a few steps to enjoy Great Food in a Casual, laid back atmosphere. A canopy tour is an established route through a wooded and often mountainous landscape making primary use of zip-lines and aerial bridges between platforms built in trees. Suitable for nature lovers, adventurers, families and all who wish to experience the ultimate canopy tour adventure; Miss Sky Canopy promises to be the experience of a lifetime. All the rides are not only extremely safe but have the added benefit of being completely smooth with no spinning and hands completely free of the line if desired, ensuring a smooth stop at the arrival pads. Coconut Harry’s Surf Shop, a full service surf shop and surf school, is located in Nosara, just a short walk to the beach at Playa Guiones. They now have a second location for surfboard rentals and lessons just steps from the beach, next to the Beach Dog Cafe at the main entrance to the beach! They have a huge supply of boards for rent in all shapes and sizes. Our surf school offers excellent instruction for all levels of surfing. They also have a huge selection of clothing, swimsuits and beach supplies.